The Moody Blues began as a raw blues band and had a hit during 1965 with “Go Now.” By 1968, Denny Laine and Clint Warwick had left the band and had been replaced by John Lodge and Justin Hayward. Their sound changed as they fused clasical and rock music together. 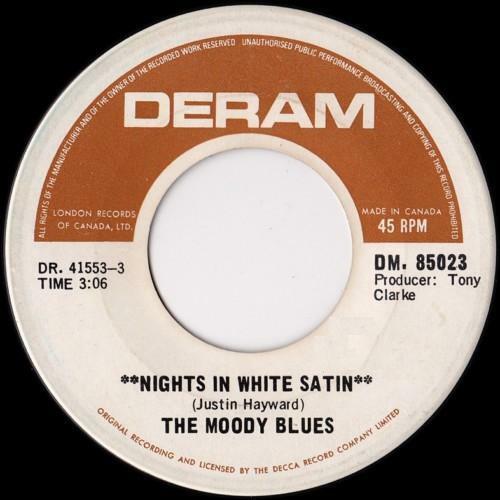 Their first single release was during early February of 1968, when they issued “Nights In White Satin.” It only reached number 103 on the American singles charts. By the summer of 1972, they had sold millions of albums and had charted six more singles in The United States. They decided to reissue “Nights In White Satin.” It reached number two on the BILLBOARD MAGAZINE Pop Singles Chart and has become their signature song. I don’t think the copy pictured is the original as it is too pristine but it still sounds fine after all these years. The Moody Blues were formed in the early sixties as a blues/rock group. And let me quickly say that the fact they are not in the Rock and Roll Hall of Fame is a travesty. Listening to their first album you hear a gritty and raw sound. Denny Laine, who later played with Paul McCartney in Wings, is the lead vocalist and guitarist and Carl Warwick is the bassist. “Go Now” would be a huge hit in The United States and England but future commercial success would elude the group. Laine and Warwick would depart and be replaced by Justin Hayward and John Lodge. The rest as they say is history. There next release, DAYS OF FUTURE PASSED would sell millions of copies and make them one of the most popular rock groups in history. “Go Now” remains the first stop in the career of The Moody Blues and is nothing like any of their future releases. And yes I did find another copy of “Do The Clam” with picture sleeve. The Moody Blues legendary performance at the 1970 Isle Of Wight Festival finally sees the light of day. While the music has been in circulation for some time, this DVD presents all the available video footage from their performance for the first time since it was recorded 39 years ago. 1970 found The Moody Blues one of the top rock attractions in the world. There album, A Question Of Balance, had been released several months before this performance and was at the top of the charts in a number of countries when this concert took place. At the festival they shared equal billing with the likes of The Who, The Doors, and Jimi Hendrix and more than held there own. Threshold Of A Dream: Live At The Isle Of Wight Festival begins with a twenty minute documentary that includes interviews with the members of the group. These interviews, which are woven around vintage video footage, give a quick history of the group, the effect of the mellotron upon their sound, and their remembrances of the festival. Seeing the modern day Moody Blues speaking about themselves forty years ago when they looked so young is both poignant and interesting. The documentary alone is worth the price of admission. Their actual performance at the festival is better than I expected. The video has been restored about as well as the state of the art at the time will allow and the quality is more than presentable. Their music also comes across well. The sound they were producing at the time was a creation of studio techniques and was difficult to present live, especially in an open air setting so large. While Mike Pinder’s keyboards are present, they wisely strip the sound down to basics which makes them more like a traditional rock ‘n’ roll band. Their set was a mixture of new, old, well known, and obscure. “Gypsy” from To Our Children’s Children’s Children may seem an odd choice for a concert starter but it quickly sets the tone for what will follow. 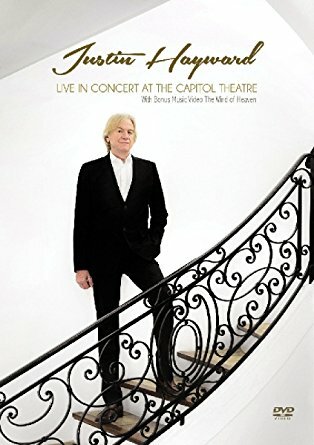 Justin Hayward is in fine vocal form on the classic ballads “Tuesday Afternoon” and “Nights In White Satin.” Lost gems such as “Tortoise And The Hare” and “Melancholy Man” are presented in all their live glory. “Question” and the encore song “Ride My See Saw” find the Moodies rocking away into the night. One of the more enjoyable features is that the group engages in more improvisation than I am used too from them as many of the songs are lengthened beyond their norm. Threshold Of A Dream: Live At The Isle Of Wight Festival is both musically historic and a must buy for any fan of the group. Music and The Moody Blues shall not pass that way again. Every once in awhile someone has a good idea that actually turns out well. That is what happened when The Moody Blues decided to record a live album backed by The Colorado Symphony Orchestra. The result, A Night At Red Rocks With The Colorado Symphony Orchestra, was recorded to celebrate the 25th anniversary release of Days Of Future Passed. The Moody Blues, especially during what is known as their core seven album period, used heavy elements of a classical sound to produce some of the most creative albums in rock history. While Days Of Future Passed credits The London Festival Orchestra, it would be Mike Pinder’s mellotron that would provide the orchestral backing which would make the group famous. During the 1980s, with Patrick Moraz replacing Mike Pinder, they would move in a progressive rock direction but would continue to play their classic material live. September 9, 1992 found The Moody Blues backed by a full orchestra, plus extra keyboardists and backing vocalists. This performance, released in March of 1993, would be a definitive live statement by one of rock’s signature groups. While I am reviewing the original CD release; the concert has been reissued in its entirety as a two disc set plus has now been issued in DVD form as well. A Night At Red Rocks does not replace any of their studio albums but stands along side of them as it presents their songs with new textures and a depth that make them unique listening experiences. The concert and the album can be divided in three distinct sections. The first part focuses upon lush orchestration. If there was ever a song made for this type of performance, “Tuesday Afternoon,” is it. Justin Hayward’s voice floats out over the sound and when Ray Thomas’ “For My Lady” follows, it quickly establishes the fact that the listener is in for a special experience. John Lodge’s “Lean On Me (Tonight),” which was originally issued on Keys Of The Kingdom, is almost a brand new and superior song. “Lovely To See You,” from On The Threshold Of A Dream, was a track I had not thought about in awhile but here is takes on a memorable life of its own. The middle third of the album is just the basic core of The Moody Blues without the orchestration. Songs such as “I Know You’re Out There Somewhere,” from Sur la Mer, “The Voice” from Long Distance Voyager, and “Your Wildest Dreams” from The Other Side Of Life are all solid performances and show off the best of their progressive rock period. The final section is basically one stunning performance after the other as The Moody Blues perform many of their best known hit songs. “Isn’t Life Strange” and “The Other Side Of Life” set the table for what will follow. “I’m Just A Singer (In A Rock And Roll Band” is John Lodge at his best as the Moodies rock with full orchestral sound. “Nights In White Satin” is perfection as rock and classical music fuse together. 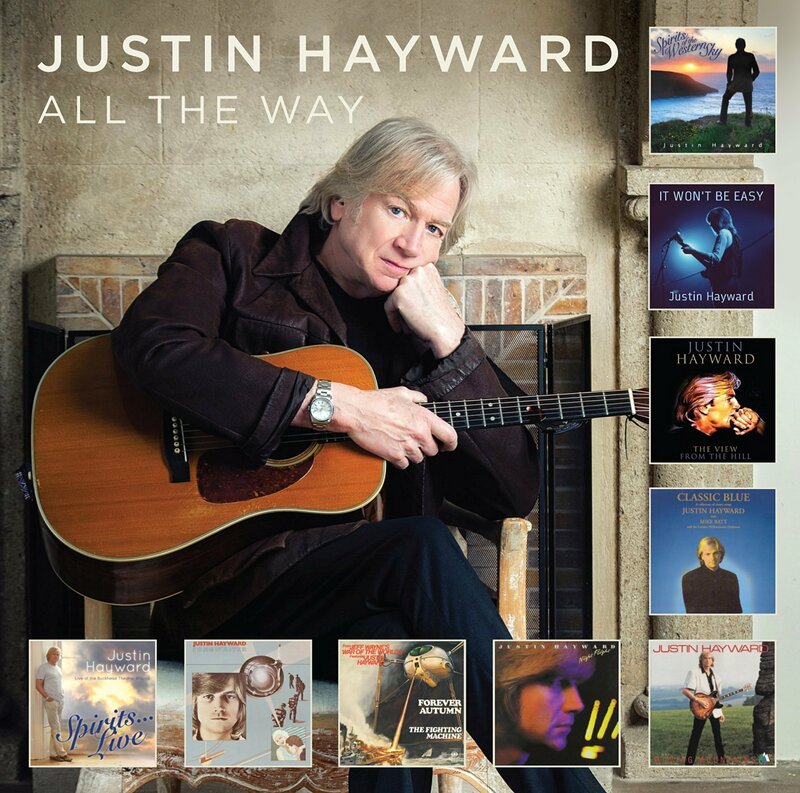 “Question” is a showcase for Justin Hayward’s voice and acoustic guitar playing. “Ride My See Saw” is the grand finale and concert closer as The Moody Blues rock into the night. A Night At Red Rocks With The Colorado Symphony Orchestra is a must for any fan of The Moody Blues. It is a wonderful companion to their studio releases and fills in some large gaps in their career. Hopefully The Rock and Roll Hall Of Fame is listening. I remember not being very excited when it was announced that The Moody Blues were going to release a Christmas album. But thought if Jethro Tull can make a Christmas album then why not The Moody Blues? It turned out that I was pleasantly surprised. December was issued in late October of 2003. It was their first studio album in four years and remains their last as of 2009. There were several firsts for the group. Ray Thomas would not appear on the album as he had officially retired. Norda Mullen would play the flute and Danilo Madonia would handle the keyboards. This was also the first time, since their first album, that they would record non-original songs. It was also their first studio album not to chart in The United States. In some ways I wish that Justin Hayward had written more songs for this album as the three he did contribute are excellent. “Don’t Need A Reindeer” is a catchy light rocker while “December Snow” is a moving ballad. Both are excellent Christmas fare and only improve with repeated listens. His third contribution, “Yes I Believe,” is a notch below the first two but still above average. John Lodge’s “The Spirit Of Christmas” is a song that has wonderful and inspirational lyrics but is set to an odd melody. His “On This Christmas Day” is probably the least effective original song as the parts just do not hang together well. There were a couple of notable cover songs. The old John Lennon/Yoko One anti-Vietnam War song “Happy Xmas (War Is Over)” is presented in a whole new context. John Lodge and Justin Hayward effectively entwine their voices to create a memorable sound. The classic carol, “In The Bleak Midwinter,” is presented in a simple and traditional manner which in this case is good. The only song that really misses is “White Christmas” which has been recorded so many times that to provide anything new or creative is difficult. December is a fine Christmas release and I bring it out every holiday season for a listen or two. It showed that The Moody Blues can still produce a quality album.